It seems it's not only David who is all about budget cuts this year in the Cameron household, his wife is at it too. 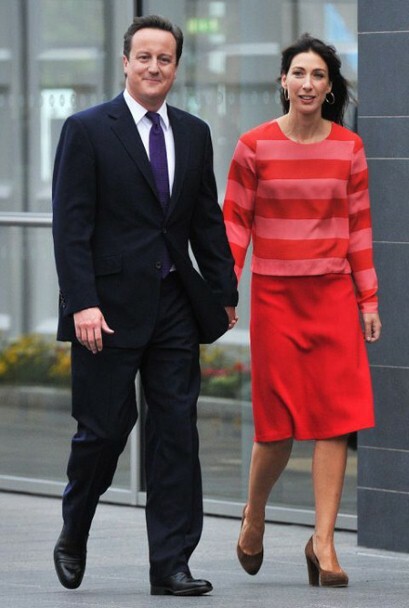 It was the Conservative Party conference this week, and Samantha Cameron made sure there wasn't a blue rinse, pearls or matching twin sets in sight (if she had anything to do with it). Here she is a fantastic, bold outfit that she wore for her husband's speech yesterday. Showing that you really can look A-Class on a B-grade budget, Samantha wore a lovely pink and red striped Whistles Bold Stripe top which you can buy for £75, reduced from £110. Her shoes are also last season LK Bennett and her skirt is from a suit she wore in 2008 by Joseph. Lovely.